I haven’t shown off any of my graphics work on this blog for a while until now. I really haven’t even worked on any graphics lately due to timing and my lack of photoshop the past few months since I got a new computer. But below is my SOTW Entry for SOTW 20. Feel free to critique, but it is my first work in a long time. 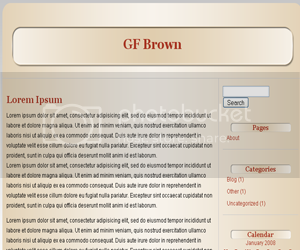 In case you have been wanting to know what my first wordpress theme GF Brown looks like before you download it, below is just a simple screenshot that gives you a taste of what it looks like. It is brown with red and black but it doesn’t give you the whole picture. The only way to know if a theme is great is to download and try for yourself. But here is just a sneak peak before you download. This is my first completed wordpress theme and it is up for you to download. You can edit the CSS to your liking. The theme is titled GF Brown and it is dedicated to my Gaming Forum. If you wish you can request custom changes by signing up on my forum and requesting. I am willing to change some parts but not all. Enjoy the theme, click the link below to start the download. As you saw in my previous Graphics post. But this one I am about to show you is not my work but it is a dear friend of mine known as FattaT. He is a graphics pro over at my forum and He has made me this ad banner for the forum as a request. And the animation thing I am still new to so I will try to get as good as him which I doubt. Well this one is the animated version of the static banner which is provided below. You can add this banner to your site anytime you wish. As I just mentioned a few minutes ago about some of my older graphics which are better than some of my newer ones. Well this one is the first in the series of iTried in my book. I just found this in my hard drive and uploaded it to share with you guys. This isn’t one of my best and not one of my worst works either. I have done better and far worse. This one is called iTried1 and this was the sig I made after not using Photoshop for over 10 months. I just used a simple brush technique and blended in the render and text. Then I just tilted the text about 20 degrees or so. Well enjoy this one and I will post more of my works . You will find more of them on my Forum – Gamers-Forum.com – just sign up and check out the graphics section. Well I thought I’d share some of my graphic works with you guys tonight. I have been using photoshop for over a year but there was a huge 10 month gap between 2006 and 2007 so I lost a lot of skills. I had to stop because of my new job, had to give up one thing and I couldn’t give up my job or web management. Stay tuned because I will post more of my work as soon as I find them on this computer. Don’t expect any tutorials because graphics isn’t really my strong suite and I am the one that needs tutorials.